In today’s competitive world, it’s really important how you are tempting the audience along with giving them better services. Now business has shifted their focus to digital marketing, in such competitive environment, it is really important how you fascinate audiences. Now a day, Stop motion is emerging as a new technology for gaining the attention of the audience. As it’s a unique and creative way of representing an idea. Secondly, the moving images are more tempting. Moreover, it’s a marvelous solution for the brands that have fewer budgets. Stop Motion is a technique in which an object is photographed with small increments in each frame so that when these photographs are moving fast, it produces movement in it. It’s a technique of creating illusion about the movements of object by moving them frame- by – frame. The basic concept of stop motion is to move objects slightly, then take a photograph of it, again move it slightly and then photographed it, when that photographs played continuously, it seems that object is moving. Stop Motion technique is a way in which how influential you can apply your skills to make a long lasting effect on the audience. It’s a way of depicting a story with the 3 D objects, clay, paper drawings, puppets, dolls, humans, etc. In this we can make very simple and attracting promo video that can tempt the audience for long. As we have various ways now a days, like Twitter, Facebook, social sites, YouTube that can bring lots of business to us. 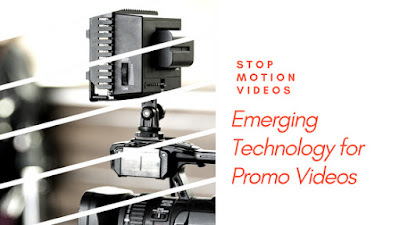 Making promo videos through this is a plus point as it depicts uniqueness and it is less costly than others videos, and if your budget is less, even then you can also use this technology. Stop motion is a highly popular animation technique that is used in marketing and explainer videos because of its flexible nature. This video can be used to build a positive image for the brand. It has a powerful impact that not only settles in the mind of people, yet inspire them to share it. Stop motion is incredibly inspirational as we can achieve new things that cannot be achieved by real life things. It is easy to create, as it requires only camera, a computer and an object that can move around and some props. The plot of stop motion is important in capturing the imagination of viewers. It should be best fit with requirement, brand name and purpose. Let’s have a look at the videos that depicts how stop motion enhance their business and change the mindset of people towards them. The video named as HONDA “PAPER” beautifully depicted their six decades of innovation through multiple animators that manipulate the thousands of hand – drawn illustrations. It took them nearly 4 months to create the stop motion video. There are roughly 3000 people who worked to create this incredible ad. This video has magnificently depicted the power of dreams -- “You never know where a dream will lead you”. This is one of the most preferred and inspired video in history of stop motion. This video named Honda as the best ad creator in their business. This ad Won award in the 2015 “Broadcast Television category” at One Show’s annual Automobile Advertising of the Year Awards. The Oscar nominated the animator of stop motion video. This video has emerged Honda as a new brand that impacts the audience long lastingly and effectively. It's right to say in that case that innovation and creativity can lead to a huge success, name and fame not only to brand but also to the creator who have developed it. This is one of the epic video of stop motion that is cleverly illustrated and demonstrated the Volkswagen brand name. It depicts the unique and incredible work. This video was made 3 years back and it represents the true creativity that builds a positive image for the brand. The plot in this video is so appealing to capture the imagination and attention of viewers. This stop motion video reveals Volkswagen as trustful and trustworthy brand in front of customers. Through this video McDonald’s have depicted that they are always working on their meal so that they can make their customers happy. They have used puppets in this stop motion video creation. This video is made as parents are not happy with the oily stuffs because of their kids' health, this video is created to show that how hard McDonald’s is working to improve their quality so that everyone be happy over there. This ad not only attracts kids to their store, but also give relief to parents. As a result, their soul gets increased in the UK. The idea behind Stop motion is very important to plot the story and most importantly how you show it. While making stop motion videos is really important that you keep idea very simple and depicts it cleverly like in this case McDonald’s have shown that the Happy Meal are brought to life like salt is removed down to a rubble chute and transported away on a truck, a book is lowered by a crane into the Happy Meal box to illustrate the millions of books that McDonald’s has distributed, oil is hand pumped out of the box by two workers as saturated fat is reduced, and a Hamburger made with 100% British and Irish beef is wrapped up by the workers below. The advert hopes to relay to parents the important decisions that McDonald’s has made, and crucial changes it continues to make, to help make the Happy Meal better. In this competitive world its really difficult for oreo to take its position in the market. Oreo has made a simple and unique ad in order to ingrain in the mind of the customers. Because of the usage of stop motion creativity Oreo was the standard bearer for "real-time marketing." Oreo has utilized all the social media like Twitter, Facebook to markets its products. It shows that with skills, it is really important how you are marketing your product. With stop motion video it is very easy to share it, as the simplest and creativity tempt the audience so much that they like to share it. It has been shot in one take with 4500 frames. At 60 feet set was created imitating the interiors of a house and the scale model BMW was moved 5mm per shot as the camera panned 5mm alongside following the car using motion control rig through Dragonframe. BMW has gained the attention of a lot of people. Many people are in amazement how stop motion video gets shot in one take. It brings the curiosity not only in the animators but also in the audience. It gained a lot of publicity. This video displayed the use of stop motion creativity with real life (humans). This video stupendously and magnificently utilized the brain with emotional touch of the daily needed items of people in cheap basis. With the advent of this ad the brand gets maximum attention of people as they gets a discount, and it gets attention of kids through their fascinating ad. It has been said that the Stop motion is a time consuming task as for even a one minute video you can take many days to photograph, depending on the plot. Despite of all this drawback it emerges out to be fruitful and more advantageous technology in terms of marketing and promo videos. As it tempts more audience and helps to withstand like a brand name. It is right to say that Stop motion animation is a way of Depicting simple and the little budget idea with creative skills that act as a stupendous way for popularizing business through promo videos.